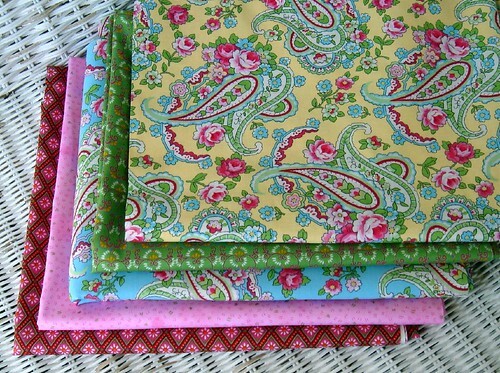 We found these pretty fabrics the other day at Joann's ... and in the clearance section. I was quite surprised by these ... very pretty, vibrant colors. The blue midway down is my favorite at the moment, it reminds me of Cath Kidston. The pink, fourth down, is hoping to be the binding for the butterfly quilt. I picked these up too. I love the vintage-look orange ... maybe a quilt, or a top for me? Hmm... I was thinking just today that I'd like a top out of a light summery vintage-look floral (I wanted something with green in it today so I wouldn't get pinched) and tonight we saw some tops EXACTLY like I wanted for $44 at the Gap and all I could think was "I could do that for a lot less!". Famous last words? Maybe, I'll have to see. Any recommendations for a good easy top pattern? The brown is for the back of another quilt I'm working on. Nothing else at JoAnn's was on sale and there were no coupons to be found. What's up with that??? I did find a coupon for this week, but nothing for last week. It's ok though ... the last thing I need is more fabric. Seriously. Check out these hot bald chicks. They really did it. And raised quite a bit of money too. They certainly have my admiration. i love that blue one, too. i have it! i also have 3 or 4 others in your stacks! I sooo love the orange one. i've found that it's hard to cut it up! it's so cool. They're all really pretty...I'm drawn to the yellow on top. I wish we had a JoAnn's in our area. Beautiful fabrics. I love the orange one!! Ok I am totally into paisley lately, which is so unlike me! But I love the ones you chose. 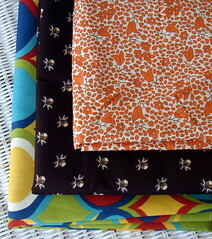 And I LOVE the second set of fabrics you posted, I love the bright colors (and orange is my favorite color). Can't wait to see what you come up with! hop on over to my place and you might just win yourself a celebratory little heart!